Two things most surprising in the long road toward finding the clay body I’ve always wanted and imagined existed are the continued steepness of the learning curve of formulation, and the frustration of continuous change of materials. It is amazing how much there is to be learned about so few categories of clays. Kaolin or China Clay, Fire clays and Ball clays remain the major categories for use at cone 10, in combination with Feldspar, Silica and perhaps a Plasticizer and/or Flocculant. Yet after twenty years of nearly constant research, testing and making of many thousands of pots, I continue to learn new lessons daily, meaning also that new and better materials appear and ask to be incorporated in the mix. As to the frustration of constantly changing materials, mines go out of business or are mined out or bought out and closed, or a company decides the specific blend of materials is too costly to produce (G-200 feldspar). Suddenly that tried and true mineral that an entire region or country has depended upon has changed or is no longer available. Such happenings can throw a severe monkey wrench into the works, so the game is a constant keeping up with the changes, especially when clay body recipes are being produced by the tens of tons. I’m a potter who works on the wheel, so my game is finding a clay body with maximum workability, that combination of plasticity and the ability for a clay to stand up on the wheel to continued working and shaping without collapse. 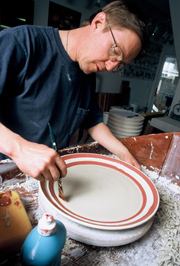 The body must be formulated so the end result exhibits reasonably low shrinkage, “correct” amount of absorption as a fired product, no warping or cracking and little if any slumping, (even for a translucent porcelain). The body must exhibit a pleasing texture and fired color, (two most subjective categories), and the body must fit a wide variety of glazes from low expansion Shino glazes to high expansion Alkaline glazes and everything in between. You can imagine why so few potters care to tackle this enormously complex aspect of pottery making and buy their clay by the box and hope it works. You may be assured that we are doing our best to make that box of clay work as advertised, but if you were to enter this game, it would become immediately obvious why clay manufacturers print a disclaimer on every box of clay they produce. I had planned to end this post with a stoneware recipe of exceptional quality, only to realize that the feldspar used is one that is no longer on the market. The solution will be the result of a line blend between Custer feldspar, (potassium based), and Minspar, (sodium based). Were it ever thus! You see the problem!